The pen I am about to review has sold in huge nos. and probably one of the best-selling pen of ASA. There was a time when I was after Mr. Subramaniam to make a demonstrator pen with screw in nib units from JoWo/Schmidt but somehow he was not able to procure the good material which could withstand the threading to be done for those units and then we gave up. 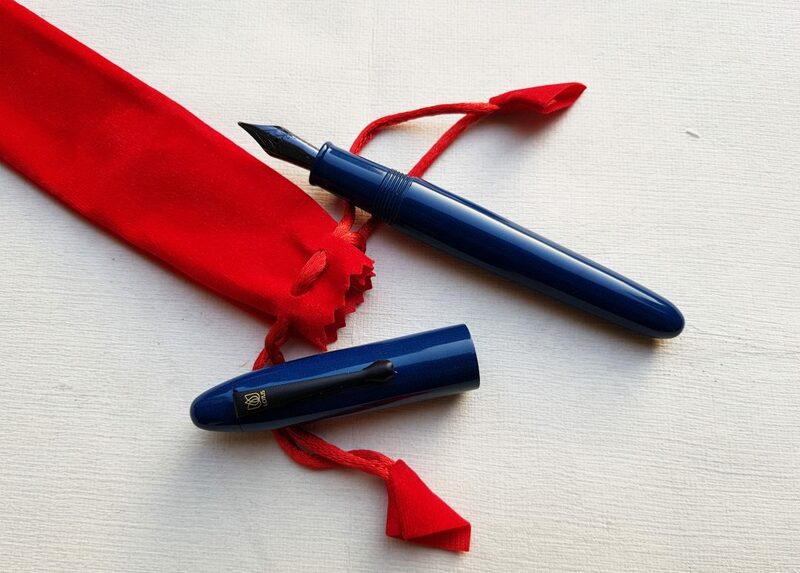 Then one fine day he informed me that he had procured a new material and will be launching an already successful Nauka in the demonstrator version (which was named TransNauka) and I was too excited for the pen and I told Mr. Subramaniam it would sell in huge nos. and therefore I convinced him that we should do a group buy for the same on FPN (TransNauka Group Buy) and believe me, it was immensely successful. The group buy was so successful that he had to stop taking orders on his website for a fortnight even after the Group Buy was closed because of his limited production capability. It’s been three months since I have got this TransNauka and further below is my effort to do a detailed review of the pen. And to my eyes, this pen is the just pure aesthetic pleasure. It’s a beauty. TransNauka inspires awe when it is inked and I believe it one-ups the already existing Nauka. It’s simple, classic, sublime and is on the lines of Bauhaus Design movement which is a unification of art, craft, and technology. The design of Nauka was inspired by famous MORA STYLOS OLDWIN CLASSIC and in fact one of the fellow fountain pen connoisseur Prithwijit was the force behind the development of Nauka. The pen without cap looks like it’s just one piece as the grip section merges with the barrel in such a form that there is no step down which is generally prevalent in many pens. The pen gradually tapers towards the bottom to an almost pointed end. Similarly, the pen tapers towards the grip section till it meets the threads at the top which holds the cap. The pen comes only in the brushed matte finish and personally prefer the brushed version better than the polished version as the polished version tends to develop micro abrasions and smudges and also looses shine over the period of time. The cap of the pen unlike the bottom of the barrel is not torpedoed shape at the top rather it is like a hemispherical dome. The pen I bought comes with chrome finish ball-end clip and it also comes sans the clip. The cap is almost 3/4th the size of pen making it a very large pen. I found the pen very minimalist with no branding. One thing I believe can be improved is to reduce the gap between the cap finial and nib unit when the pen is closed. The pen is beautiful and is bang for the buck at the price and yeah this beauty is handmade. One look at the pen and you won’t actually believe that this pen completely hand-turned. It’s almost perfectly shaped and finished from the exterior. One thing I found that as much as the exterior is well finished and shaped, the interior of the barrel was not paid much attention. There are certain undulations in interior (1 or 2 places) of the barrel which result in the formation of O-rings like shape inside the barrel with ink. I received two pens, matte brushed finish and the clear polished one. The clear polished one was all over the places with regards to finish and thus it was not launched officially. This brushed finish is superb barring one area with regards to barrel interior area. The brushed finish is also better because of the fact that it hides the lathe marks and also is not smudge-prone. The quality of material used is quite good but is brittle in nature and thus one has to be careful with regards to handling (against falls). The acrylic used is the hard non-modified PMMA and apt thickness of the material are used in pen and is quite better compared to ones used in TWSBI. The pen is quality finished one which needs to be handled carefully and if proper care is taken it will last you ages. I love my TranNauka but I care for every pen that I own. If you are the one who keeps throwing his/her pen here and there then I suggest you go for the ebonite version. The cap of the pen doesn’t post securely and that’s because of the design. But.. But… But… the pen is so big even uncapped @ 135 mm that there is no need for posting. The pen is little heavy towards the nib and I believe this could have been countered by providing solid crystal end at bottom of barrel. Nevertheless, this was no issue for me, it’s a minute difference and some of you won’t even notice. Initially, I had trouble adapting to the grip of the pen because of gradual slope of grip section from barrel to top of nib unit but now that I am using the pen since 3 months I have gotten used to it. The grip might also be fat for some because of the design and might not be so good for people with small hands. Now for me, it was okay because I prefer big pens. The pen is big yet light in weight but one thing I noticed is that when uncapped it is lighter than Ranga Bamboo Demonstrator but almost 4 gms heavier when capped and both are equal in length when uncapped but when capped the TransNauka is larger of the two. As clear from above pics its a bit fat compared to others. The pen can be bought in a variety of #6 sized nib options from JoWo or Schmidt and in various point widths. The one I have here is JoWo Steel 1.1 Stub nib in Black Oxide finish. The nib is a screw in nib unit and easily replaceable. The nib that I got was a lemon and was scratchy out of the box. I had to tune it and now it performs the way I want. Advice to people if you are buying the pen from ASA do avail the option of pen/nib testing this might delay the pen delivery but pen and nib will be checked for writing before dispatch and yeah there are no extra charges for that. It can take international long or shot cartridges, international converter and can be used as an ED also. The pen looks best when eye dropper-ed and I applied silicone grease to the threads before using it as ED pen. Ink capacity as an eye dropper is 4 ml and will vary with every pen as it is handmade one. The pen was bought at group buy price of Rs. 2200 and it was a steal at that price. And now the prices have increased yet it is a value for money option. Beautiful pen but I won’t recommend this to people with small hands. The pen was bought via group buy on FPN and there will be another group buy in near future for the same. Simultaneously who don’t like waiting for group buys can buy directly from ASA website : LINK. And the last I checked its available on pre-order only with waiting for 4 weeks. Wonderful review, really feel like buying one now! Which ink have you used here? When will be the next group buy? Very nicely reviewed sir. The pen is best itself. I really liked it. And after reading this review my hands are itching to get hands on this beauty. I have one question sir. I have a extra schmidt nib unit. So what if i order the pen with asa nib and then replace it with schmidt. Is the threading same for both nibs? is there much burping? I’m planning to buy one.. I’ve had burping problems with my platinum preppy M nib, despite silicone grease and O ring..
and how about the stock ASA Nibs? Ve replied the Nib is good.. Ask seller to check the Nib for any scratchiness.. Very detailed review! I got my TransNauka a couple of months back as well and love writing with it. I got it with Schmidt medium nib which writes very well! this is one of the most comfortable pens to hold. just for the writing comfort i will rank it first along with model 4c . and the frosted appearance demonstrator is great for exotic coloured inks..